This Friday, June 21, there will be a a marathon free concert, “Tradition with a Twist” featuring diverse styles of music, at the Granite Prospect on Pier 1, Brooklyn Bridge Park. It will begin at 2:30 in the afternoon and go until sunset at 8:31. 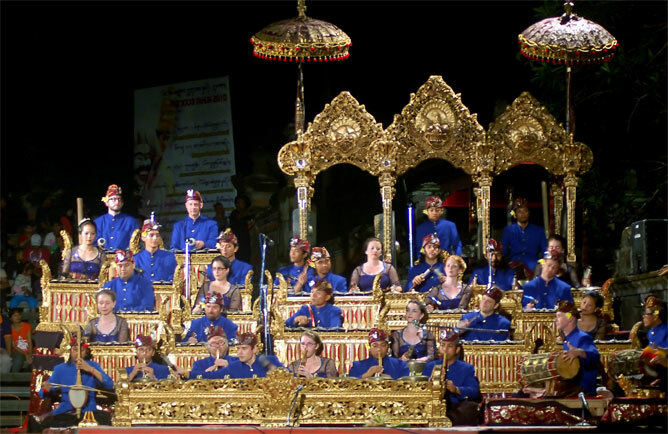 The headline act is the Balinese orchestra Gamelan Dharma Swara (photo from their website, by Widnyana Sudibya), who invited some of their friends to come along and play. Among these are: country and bluegrass group Chicken Barn Heroes; the Bleecker String Quartet; the “[e]lectric, sweaty, bumpin’ Balkan music” group Tipsy Oxcart; percussion ensemble Akshara, whose style is rooted in Indian classical music; American roots musicians Union Street Preservation Society; Australian jazz singer Nerissa Campbell, and bagpiper Matthew Welch. Performance times are here. The concert is part of MakeMusicNewYork. Claude, thank you for concert info on June 21 as the BBP event calendar doesn’t list anything for that day.